My conscience is clear, but that does not make me innocent. It is the Lord who judges me. Therefore judge nothing before the appointed time; wait until the Lord comes. He will bring to light what is hidden in darkness and will expose the motives of the heart. At that time each will receive their praise from God. None of us are justified by our own judgment, both because it can never be accurate enough to judge rightly, and because that judgment belongs to Christ Jesus alone. For all of our posturing and good deeds, everything we measure and weigh each day of our lives amounts to an incomplete picture of who we really are. Even if our “consciences” are clear, know they can only reach so far into who we are; they are not a measure of righteousness or holiness. Holy Spirit, lead us into humility and gratitude, even shedding light on the dark places of our hearts. It seems to be the way many are headed today. What? Down the wrong path. Pastors are leading many to eternal damnation and not eternal life. In the book of Jude we read in verse 4 that many will be in the churches that will try to tear the children of the Lord apart and cause division and lead many in the wrong way. (I PARAPHRASED THAT). I find it interesting that it says, long ago many were designated for this condemnation. God warned us about everything. We have to pull ourselves away from the things of this world and make time for Him and His word so that we are not deceived and we know the truth when we hear it. We seem to have a huge movement saying there are many ways to get to Heaven. There is more than one way to God. NO, THERE ISN’T! We must be careful and not go with the flow. We are responsible too. We cannot blame not knowing the truth is the fault of someone else or because of our pastor. They WILL answer to the Lord themselves for leading the flock the wrong way. We will also have to stand before the Son of Man and we will have to answer why we didn’t know we were being deceived. You see, if we are reading the Bible, the words of the Lord God, and we are following its instruction and are praying to our Father in heaven and are seeking Him and His righteousness and His divine wisdom. IF we are doing these things will we not know the truth when we hear it? Will we not know when we are hearing lies from the pulpit? Yes, it means you may have to separate yourself from friends and family who are following false doctrine. Sometimes the path to the Lord God feels lonely. God is with us and you are not alone. You will find others along the path, it simply seems a path less traveled. That is because it is. 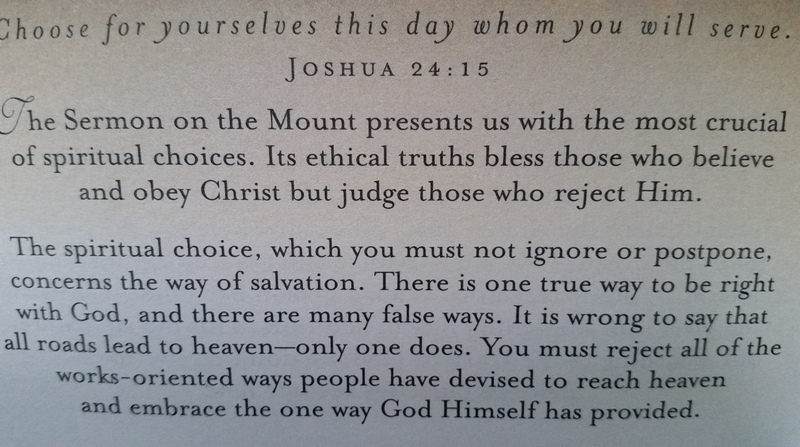 REMEMBER, there’s but one way to the Father in heaven and we are each responsible to know when we are on the wrong path. We each must choose whom it is we will serve. If you are unsure then cry out to God and ask Him to reveal Himself to you, to reveal His truth to you. To open your eyes and ears to see and hear the truth according to Him and not man. He will not withhold the truth, or His wisdom from any who seek Him and pray and ask for His guidance.